Pan-African News Wire: What Should Be Government's Top Priority? 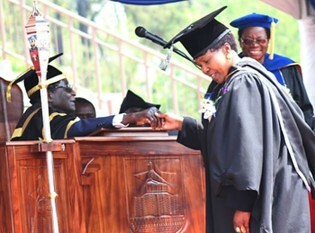 Republic of Zimbabwe Minister of Community Development and Gender Oppah Muchinguri receives masters degree in international relations at the University. She is congratulated by President Mugabe on September 13, 2013., a photo by Pan-African News Wire File Photos on Flickr. What should be Govt’s top priority? “What do you want to be when you grow up?” is a question that each of us were asked at least more than once by our primary school teachers and at some point during that time we were asked to write a short descriptive composition of what an ideal life would be in your chosen career. Back home, parents hoped that their investment in your education would someday pay dividends by way of taking care of them in their old age. The summation of answers by pupils to this question would include, living in their own houses with modern amenities in the urban areas, good salaried jobs that would enable them to give their children a solid and healthy upbringing, and even perhaps owning a small business. In short, the majority of the class would at least aspire to be part of the thriving middle class of the economy. The middle class is the back bone of any economy because it is the largest contributor to Government personal tax revenue, the largest contributor to national savings (through pension funds and mortgages), and drives consumption which is key for economic growth. The African Development Bank describes the middle class as those individuals spending between US$2 and US$20 per day. The Zimbabwean middle class since independence had been growing at a steady pace until in the late 90s and early 2000s when the economic hardships in the economy forced them to migrate in search for greener pastures in the diaspora. As a result the country lost valuable skills as well as its tax base which also contributed to the further decline of industry and overall Government income. However, in 2009 with the adoption of the multi-currency regime a new middle class began to emerge, which with little credit from Government has been largely responsible for the so called recovery seen by the economy to date, through their hard work and dedication across all sectors of the country. Each year, around this time, Zimbabwean universities and other tertiary institutions add on at least 30 000 new graduates into the ever-growing population of employable citizens. However, because of economic stagnation over the last decade, the jobs created by the economy have been growing at a slower pace than the rate at which these graduates are being released into the labour market. After experiencing extreme hyperinflation during the 2000s, the Zimbabwean economy now under the multi-currency regime, is in our opinion currently showing some undesirable deflationary symptoms, which in simple terms is the opposite but worse than inflation. Deflation relates to the general decline of prices as a result of a reduction in the supply of money or credit. A decrease in Government, personal or investment spending can also cause deflation. Declining prices as reflected by our annual inflation (CPI) which is now close to 0 percent might seem good to the layman as goods and services may be purported to be getting cheaper, but if such a phenomenon persists it has serious negative ramifications for the economy such as, falling corporate profits, closing down of factories because of weak demand, shrinking employment and incomes due to massive wide scale retrenchments, and increasing defaults on loans by companies and individuals, all of which are symptoms currently being experienced in Zimbabwe at this moment. Experts indicate that ideally manufacturing sector should employ at least 50 percent of the labour force. The 2013 manufacturing sector survey, however, points to the nation moving in the reverse direction with the overall industry capacity utilisation dropping from 44,9 percent in 2012 to 39,6 percent in 2013 due to a cocktail of constraints from lack of financing mechanisms, obsolete machinery and equipment and abundance of cheap imports. If the manufacturing sector cannot absorb this labour, what shall we make of the existence of an economic middle class in the future? This is probably the reason why the country is faced with an unemployment rate that is currently estimated to be in excess of 80 percent. The state of the local industry requires a complete re-engineering of the current business models to accommodate technological and global advances as well as ensure competitiveness on the local and international market. Investment in utilities by Government such as energy and water will go a long way in closing the local supply gap that is being created by uncompetitive prices as well as legacy/pre-dollarisation problems that have resulted in the ballooning of the county’s trade deficit. A local leading economist has already pointed out the country’s electricity problem if ignored for another five years will have serious negative ramifications across all economic sectors if one looks at the growing demand for power in the country. In addition, excessive dependence on imports for consumption means that we are exporting jobs to other countries which can only be dealt with if the local industry is producing at com petitive prices. There has also been a huge outcry on the strain that labour costs have exerted on businesses across all economic sectors. This scenario in our opinion has occurred because of two main reasons firstly; because of an out dated labour law that was crafted post-independence to protect black workers from the then majority white owned and run companies. The situation 33 years down the road has drastically changed therefore a review of the country’s labour laws to reflect the new realities within the country is imperative as industry cannot thrive under such an expensive labour base and most importantly cannot absorb more labour from our tertiary institutions. The second reason why labour costs are very high in Zimbabwe is mainly to do with very high expectations that were born out of hyperinflation which dictate that everything should go up in price after a while as was the case during hyperinflation. According to a leading local economist it is estimated that US dollar used in Zimbabwe is at least 15 percent to 20 percent overvalued compared to the United States, a situation which has also affected labour costs within the country. The Government is currently spending over 70 percent of its budget on civil servant salaries, therefore through a salary increment scheduled for later this year or early 2014, plans to increase this expenditure to probably between 80 percent and 90 percent of the budget which becomes excessively high. Leading economists have concluded that although Government wages are an important element to achieve efficiency in the labour market, high Government wages induce too many unemployed to queue for public sector jobs whilst triggering a rise on private sector wages, which lowers job creation in the private sector and raises unemployment. Against this background, it is our belief that civil servant salary increments, although good for the hard working civil servants, are only going to incite a wage war in the private sector which will further reduce the country’s productive competitiveness whilst also increasing unemployment. The prevailing high levels of unemployment in the country has given rise to increased activity in the growing informal sector, which is mainly composed of retrenched or unemployed citizens seeking to make a living. Their contribution to the GDP is often underestimated but remains crucial to the economy on the consumption and indirect taxation front of Government revenue. Most of the businesses in the informal sector never really go anywhere from a growth perspective because of lack of capital and adequate business expertise, but are still very important from a survival of many in this country. This is the plight of most graduates coming out of the country’s tertiary education system. With massive business closures and retrenchments continuing to take place under the harsh economic environment, the future of many in the country’s middle class is once again under threat as before. Government cannot afford to let the working class of this country die like it did during hyperinflation because it stands to lose more than tax revenue from such a development. Unemployment remains one of the biggest problems faced by the people of Zimbabwe therefore it is high time that Government prioritised the creation of jobs in its policy framework. The politicians should know what policies need to be implemented and as well as removed from our current policy framework in order to get the economy back on a growth path. It is important that the population at large begin to understand that many of the decisions made since independence need to be reviewed, because the rest of the world has evolved whilst we have remained stagnant. At the end of the day, the ultimate beneficiaries should be all the Zimbabweans and not a select few. For example, how many jobs have been created since the inception of the indigenisation policy? Furthermore, what incentives, given the present restrictive labour laws in favour of employees, are there for employers to increase their workforce? This article was written by Zimnat Asset Management for FinX.